The Hebrews were the ancestors of the modern Jewish people. Most cultures of the ancient world believed in many gods, but the Hebrews were monotheistic; they believed in only one God. The Hebrews have a written tradition called scripture that refers to events from 4000 years ago. According to Hebrew scripture, God told Abraham to leave his home in Mesopotamia and travel with his family to a land on the Mediterranean Sea. God granted the land to Abraham and his family, so it became known as the Promised Land. The Hebrews believed they had a special relationship with their God and that they were God’s chosen people. The Hebrews traveled to Egypt to escape a famine. A famine is a period of great hunger. For hundreds of years the Egyptians treated the Hebrews well, but as the descendants of Abraham began to outnumber the Egyptians, the pharaoh, or king of Egypt, enslaved and mistreated the Hebrews. Moses became a leader of the Hebrews. According to Hebrew scripture, God told Moses to lead the Hebrews back to the Promised Land. God sent ten deadly plagues to Egypt when the Egyptians would not release the Hebrews from slavery. When the Hebrews did escape, scripture states that Moses parted the Red Sea for just enough time to allow the Hebrews to pass. The Hebrews wandered through the desert for forty years before returning to their home. The passage from slavery in Egypt back to their home in the Promised Land is remembered by the Hebrews every year in a celebration called Passover. While on their journey back to the Promised Land, the Hebrews stopped at Mount Sinai. There God revealed to Moses a set of laws called the Ten Commandments. The Ten Commandments became the model for both Jewish and Christian moral thought. Upon their return to the Promised Land, the Hebrews established a nation they called Israel. One of Israel’s greatest leaders was Solomon. Solomon married the daughter of an Egyptian pharaoh and established a friendly relationship between Israel and Egypt. Both nations grew strong during this period of peace, and Solomon used his great wealth to build a magnificent temple in Jerusalem, Israel’s greatest city. The kingdom of Israel became a secular nation. Secular refers to attitudes and activities that have no religious or spiritual basis. Over the course of many years, the word Hebrew became associated with a nation that was willing to absorb new teachings and ideas. The word Hebrew no longer held a spiritual meaning to the people of Israel, so religious leaders began to refer to themselves as Jews. In 586BCE, the Babylonians of Mesopotamia destroyed Solomon’s temple. The Jews were exiled, or forced from their homes, and made to move to Babylon. The Jews continued to practice their faith by praying and reading their holy texts. The holiest book of the Jews, the Torah, became part of the Old Testament of the Christian Bible. 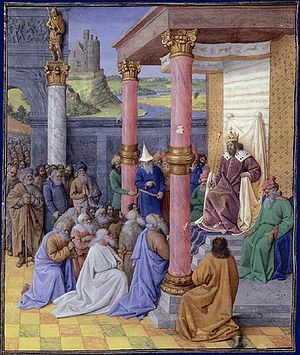 About fifty years after the Jews were exiled to Babylon, a Persian leader named Cyrus allowed the Jews to return to their homeland and to rebuild their temple. Many years later, Israel fell to the Roman army. The Jews revolted against Rome in 66CE, so the Romans destroyed their temple and forced the Jews to once again leave Israel and live in exile. For the next 1,800 years, most Jews lived as minorities in other lands. The Jews remained united despite often severe treatment. European Jews were ordered to leave Spain by King Ferdinand and Queen Isabella in 1492. The Jews also faced organized massacres called pogroms in many nations, particularly in Eastern Europe. In the last century, as many as six million Jews were murdered in the Holocaust, where the Nazi party of Germany attempted genocide, or the planned killing of a whole group of people because of their religion or nationality. In 1948, the United Nations created a homeland for the Jewish people on the land the Hebrews once occupied. This homeland became the modern nation of Israel. Many of the Arab people who lived in the region did not believe the United Nations had the right to create a homeland for Jewish people on land they considered to be Arab. Several wars and a great deal of violence followed, but Israel continues to be a Jewish homeland, coexisting in an often uneasy relationship with many of its neighbors. 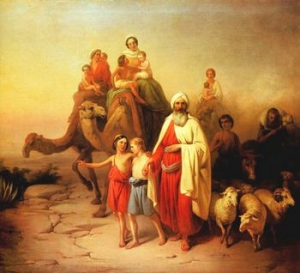 Abraham Moving Out by József Molnár (1850) According to Hebrew scripture, God told Abraham to leave his home in Mesopotamia and travel with his family to a land on the Mediterranean Sea. Moses Receives the Tablets of the Law by João Zeferino da Costa (1868). 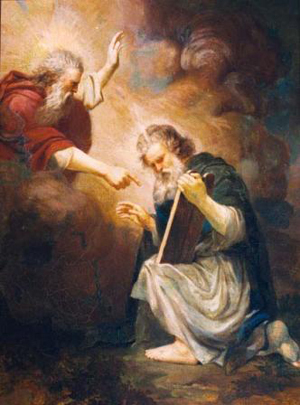 God revealed to Moses a set of laws called the Ten Commandments. The Ten Commandments became the model for both Jewish and Christian moral thought. 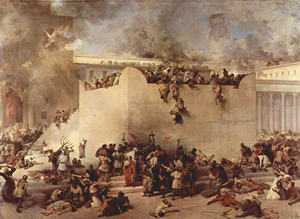 Destruction of the Temple in Jerusalem by Francesco Hayez (1867). The Romans destroyed the temple and forced the Jews to once again leave Israel and live in exile.